27 years, 6 months, 4 days old age. Shardul Thakur will turn 28 on 16 October, 2019. Only 5 months, 25 days, 22 hours, 14 minutes has left for his next birthday. Shardul Thakur has celebrated the total number of 27 birthdays till date. See the analysis by days count and bar graph. 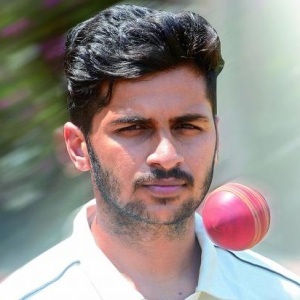 Shardul Thakur was born on 16-10-1991 in Palghar in the state of Maharashtra, India. He is an Indian Cricket Player. Shardul is an audacious fast bowler who mostly relies on his strength of hitting the deck hard. His biggest weapon though is swinging the new ball. Over the years, Shardul has fixed himself in the star-studded Mumbai line up as their spearhead bowler. He along with the veteran Dhawal Kulkarni were instrumental in Mumbai winning their 41st Ranji title. Thakur was adjourned Man of the Match for taking eight wickets in the match which included wicket of the star Indian batsman Pujara. Shardul Thakur made his first-class debut in the 2012-13 seasons and in his very first first-class season enjoyed being the part of the winning team at the Ranji Trophy. Though he didn’t play any significant role in that season since then has been the go-to man for Mumbai. Whenever the chips are down this young lad has delivered. Thakur initially was a bit obese and was asked to lose some weight. Thakur sweated it out in the gym and came back fitter and leaner after his debut season. He rose to prominence from the 2014-15 season where he was the joint highest wicket-taker with 48 scalps to his name. In the 2014 IPL auctions, IPL team Kings XI Punjab bought Thakur for INR 20 lakhs. He only got to play one match in his first two seasons for the team. In the 10th season, he was traded to the IPL team Rising Pune Supergiant. He has been amongst the wickets for Supergiant and because of a fruitful domestic season followed by IPL, he has kept in reserves for the upcoming Champions Trophy in England. He finally got his chance when India toured Sri Lanka in 2017. However, he didn't had a great start to his international career but made amends for it in his very 3rd ODI where he ended with figures of 52-4. He has since last one year made it to the 15 man squad but get's chance only when Bhuvneshwar Kumar or Jasprit Bumrah are rested. His good 2017-18 season has fetched him good a good reward when he was bought by IPL team CSK for 2.6 crores and will be playing for them in IPL 2018. He even after some fine outings at the domestic circuit has been overlooked for the national team. He was born to Narendra Thakur. He was weighing 85Kgs when he made his first-class debut. Sachin Tendulkar advised him to cut down weight so that he can play to the full of his abilities. Shardul Thakur was bought at a whopping INR 2.6 crores at the IPL 2018 player auction.